What Does a Fingerprint Analyst Do? A fingerprint analyst is a scientist who studies, evaluates, and preserves fingerprints (and sometimes handprints and footprints) as part of an investigation into a crime. Fingerprint analysis remains an important career within forensic science, which is the application of science to criminal and civil law. A fingerprint analyst falls under the broader category of forensic science technician. The job is also known as a fingerprint examiner, forensic print analyst, and latent fingerprint analyst. Sweep crime scenes for fingerprints, palm prints, and footprints. Preserve collected print specimens for analysis. Identify and label collected prints. Use special technology to enhance, examine, and test prints in a laboratory. Analyze test and examination results. Prepare detailed reports of the findings. Load images of prints into fingerprint state databases and the FBI's Automated Fingerprint Identification System (IAFIS) for comparison. Verify possible known print matches. 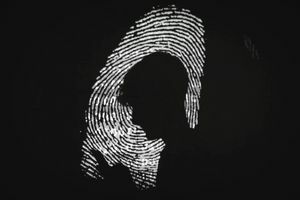 Fingerprint analysts are typically government employees, working for organizations such as law enforcement agencies, to collect, preserve, and analyze fingerprint evidence left at a crime scene. Fingerprint analysts may also be called upon to provide expert court testimony if a case goes to trial where identity is in question. College education: Most employers require at least a bachelor's degree in a related field, such as forensic science, biological science, chemistry, or criminal justice. Many also require graduate degrees as well. Additional training: In addition to a degree, you'll need to obtain specific training in fingerprint identification and analysis. This may be provided by an employing agency or offered at a criminal justice school, at a law enforcement or forensics academy, or through a crime scene certificate program. Employers also ask fingerprint analysts to complete specific courses offered by the Federal Bureau of Investigation (FBI) or Department of Justice. These courses can include but are not limited to Fingerprint, Impression, and Pattern Evidence; FBI Fingerprint Examiner Training Program; Scientific Basics of Fingerprints; and Advanced Comparison for Tenprint Examiners. Professional certification: Some employers require additional professional certifications. The International Association for Identification offers two such certifications related to fingerprint analysis: Latent Print Certification and Tenprint Fingerprint Certification. To get these certifications, candidates must meet the education, experience, and training requirements set by the association's board. They must also pass an examination and receive endorsements. Attention to detail: This is a must due to the very detail-oriented nature of the job. An ability to notice the very subtle differences between prints is key to doing the job. Comfort with technology: Fingerprint analysts must use several types of technology to collect, examine, and compare fingerprint samples. Patience: Much of the job requires long hours at a desk or table, studying a computer screen or fingerprint cards to compare the lines and swirls in the prints, looking for a match. Communication skills: Fingerprint analysts must be able to explain their findings in written reports and verbal communication with lawyers, detectives, and other law enforcement officials. They must also be able to competently testify in court in regard to their findings and methods used. According to the BLS, growth for all forensic science technician careers, including fingerprint analysis, is expected to remain well above average for the foreseeable future. Jobs in the field are projected to grow 17 percent during the 2016–2026 period. Fingerprint analysts can work in the field, in the lab, or in a combination of the two. Usually, most of the work performed by fingerprint analysts is done in a laboratory. If a fingerprint analyst doesn't do it, a crime scene investigator, police officer, or detective will sometimes locate, identify, and "lift" fingerprints from the surfaces of crime scenes in the field, preserve them, and send them to the lab for comparison. The fingerprint analyst then takes the necessary steps to analyze the prints in a lab. Fingerprint analysts in a laboratory can usually count on a standard full-time, Monday-through-Friday workweek year-round. However, they may need to be on call during other hours if they're working on urgent cases or be available to collect prints in the field.